The latest weekly oil and gas rig count revealed a drop for the nation and Kansas while Oklahoma was the only state to see a rise, according to Houston-based Baker Hughes Company. Oklahoma added a rig for a new count of 145 compared to the 122 active rigs from a year ago. The U.S. rig count fell by three to reach 1,076, up 147 from a year ago when it had 929 working rigs. Canada’s rig count slid by five in the past week, reaching 199. Canada had 176 working rigs a year ago. While Oklahoma’s rig count saw a slight increase for the week, Kansas lost two rigs for a total of 46, according to data from the Red Top Rig Report. Texas remains on top of the nation’s active rig list with a total of 531 as it fell by one this week. Louisiana lost four rigs to reach 65. Colorado also lost a rig for a total of 33. New Mexico remained flat with 108 active rigs. 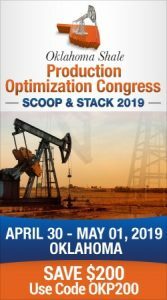 Of the various oil plays, the Eagle Ford play in south Texas added one new rig for 79; the Haynesville gained one for a total of 52 rigs; and the Marcellus play experienced the greatest loss, dropping by two for a new total of 56.